The headliner is who they all came to see, of course. In this case, it was Don Henley, fresh off his recent Kennedy Center Honors accolade as a founding member of The Eagles, touring in support of his most recent solo album Cass County. For over two hours on Tuesday night at Ruth Eckerd Hall, Henley crisscrossed the four decades and various signposts of his storied career, dusting off a few surprises along the way like a brass-enhanced “Shangri-La” (from 1989’s The End of the Innocence) and, late in the set, a timely cover of the 1985 Tears For Fears anthem “Everybody Wants to Rule the World” that roused the punters out of their plush theatre seats for the first time since he’d walked on stage. More often than not, though, Henley stuck to the fundamentals—the solo hits (“Dirty Laundry,” “New York Minute,” “The Boys of Summer”) and The Eagles classics (“One of These Nights,” “Life in the Fast Lane,” “Desperado”)—which he and his 15-piece band performed with veteran precision and vitality. Openers JD & The Straight Shot served up something uniquely different and altogether dynamic, complementing the familiarity mostly inherent to Henley’s set with a batch of songs illuminating scenes of mortal sin and gospel salvation, conjuring malevolent spirits along with the feistiness of a gothic folk revival. Led by vocalist/guitarist Jim Dolan, guitarist Marc Copely, bassist Byron House, and violinist Erin Slaver (whilst featuring an assortment of other side men and women depending on what each song suggested), the group betrayed influences as earthy as The Band and Johnny Cash and as eclectic as Tom Waits and Lyle Lovett. Mr. Dolan’s gruff inflections added a storyteller’s authority to standout performances of “Perdition” and “Better Find a Church,” while Ms. Slaver’s lithesome touch on the strings showcased “Ballyhoo” in noirish focus. Previewing their as-yet-untitled forthcoming album, the group offered “I Know, You Know, I Know” as a snapshot of love and lust’s most clandestine impulses. 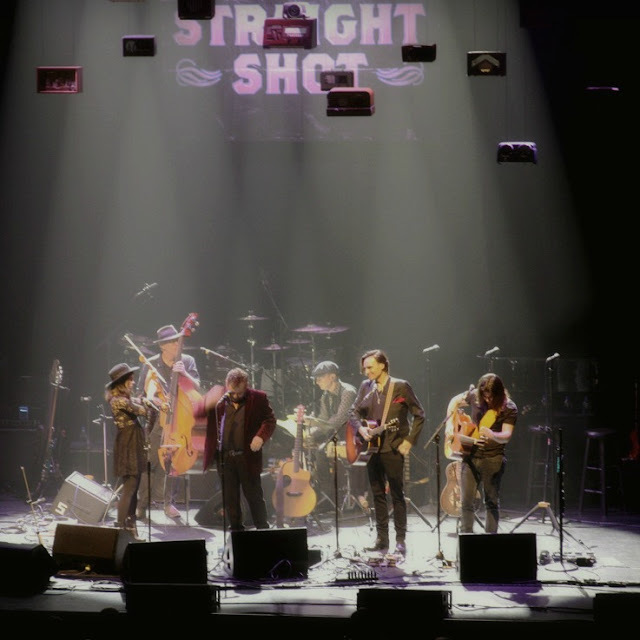 By the end of their all-too-brief appearance, JD & The Straight Shot had worked their own brand of magic to charm an audience that was originally not their own.